I’m going to keep this simple. It’s something I’ve been learning over the past few years – but it’s become incredibly real in 2019. This is the way I’ve grown as a filmmaker. Most of the time folks tend to be on one side. A lot of us (I’ve done it), are all about the passion work. We sit around and complain about ‘the man.’ We turn down clients and spend months waiting to make a few dollars to rent some gear for a short film we’re putting together. Or you’re on the other end of the spectrum. You spend 365 doing boring client work. You make decent money, but you can’t remember the last time you actually were proud of a project you exported. The ultimate goal for all of us is getting paid to do passion projects. And I believe the path to get there is by getting that wheel moving! How to move the wheel? The wheel above is about fueling passion work with paid work, which in turn gets us more paid work. 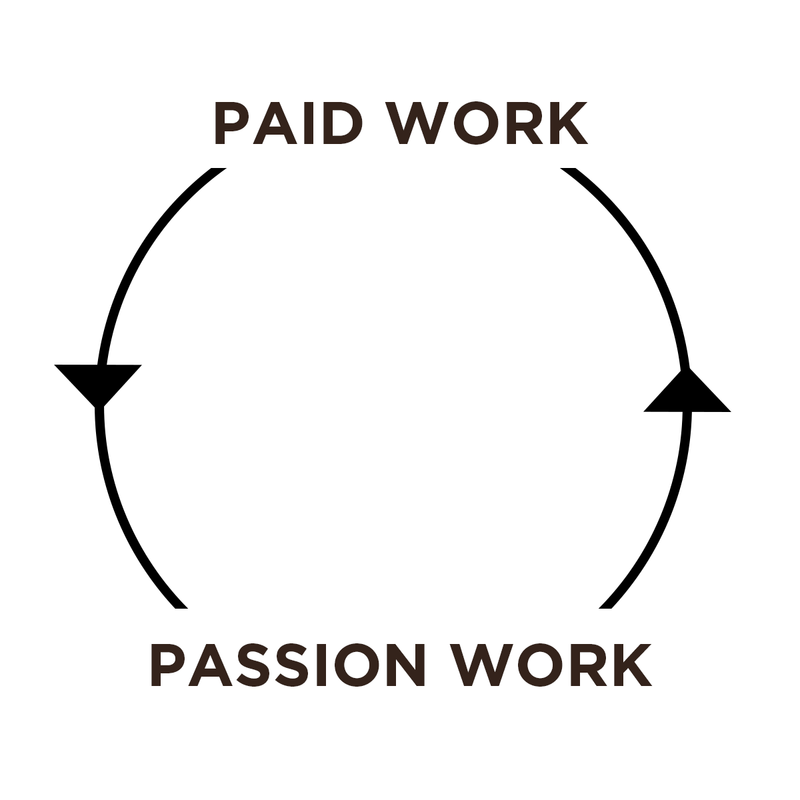 This wheel is ultimately heading towards the direction of doing PAID work that you are PASSIONATE about. It seems to be the best path to get there. Sure there are bumps and exceptions. But let’s jump into how this works if you’re at the beginning. You will get there. BUT the benefit of doing these kind of jobs (especially if you haven’t done much work) – you’re going to learn the basics of filmmaking like the back of your hand. You won’t be able to handle giant budgets and crews. Use this as a time to LEARN even if you’ll never put the final projects on your reel. And lastly, start saving that money to finance your passion work. Once you’ve built up a bankroll, it’s time to flex your passion. Set a budget, of $5k. Rent a camera, call in your favors and hustle. Put together a project that is short, emotional, beautiful, and will help you land more commercial work. It’s not going to win Sundance, but that’s OK. One step at a time. Investing that $5k is going to do a few things. You’ll see the value in your own work. If you’re willing to spend $5k on yourself – you won’t have an issue charging $5k on your paid work. You’ll be able to up your rates and bring in more projects. The wheel has started working. This is where the loop starts to work. This passion project will start to land you higher paying jobs. Now you could take that money and buy a bunch of useless gear that will probably sit in your office. OR you could spend that money on another passion project. Now spend $15k on a project. Hire a DP, rent some gorgeous lenses, and create something even better than your $5k project. Now once this passion project is done, you’ve lifted your reel 10x. You’ll start to attract clients that want QUALITY. And you’ll be able to start charging more. One because your work looks awesome. And two, because if you’re willing to put in $15k on a project, it’s easy to ask a client too. Again, the ladder keeps going higher and higher. It ultimately leads to cooler passion projects. And another benefit… your passion work will attract clients that want a similar style. So you can move away from those corporate talking head videos, and start working on projects that are more similar to your taste. Like I said, I’ve become more aware of this cycle in 2019 and I’ve really started to see it work in my own journey as a Filmmaker. So hear’s a question for you, what’s the most you’ve spent on a passion project this past year? I’d love to hear your thoughts. Send me an email at gofilmnow@gmail.com.